The Park has awarded a £13 million design and build contract for Plot 12, a new state of the art office building, capable of housing laboratories, and with roof terrace, comprising 61,500 sq ft (5,713 sq m), to Barnwood Construction Ltd.
Gloucestershire-based Barnwood Construction has delivered commercial office and laboratory projects for many clients across southern and central England including: MEPC, Renishaw plc, and the University of Surrey. It employs approximately 100 staff and trade operatives. 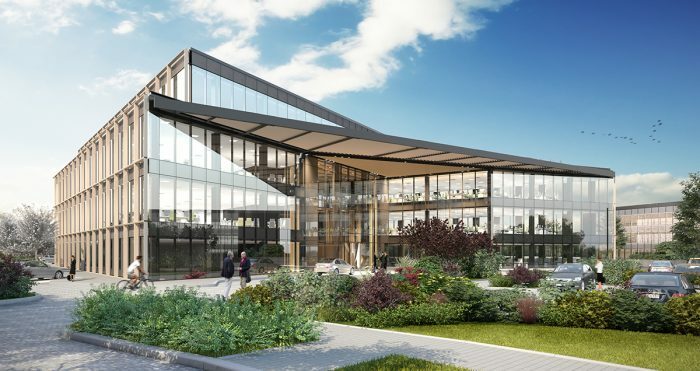 Simon Carey, managing director, Barnwood Construction said: “We are delighted to have been appointed to construct this prestigious and exceptional building on The Oxford Science Park. We will deliver a Category A office building to the landlord’s specification and have the capability to deal with future occupiers’ Category B fit out works delivering bespoke internal configurations. Barnwood Construction was appointed following a competitive tender process. Construction will start on 20 February 2017 with completion due in March 2018. Once completed, Plot 12 will be the only new Grade A office space available to rent in Oxford.